Zoanthids are some of the coolest things to keep and also some of the hardiest. These zoanthid button polyps fall into this category of being both hardy and incredibly beautiful. 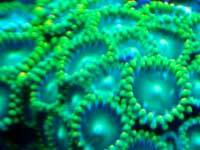 Some refer to zoanthids as simply zoas or button polyps. They are not all that demanding and will do fine in most saltwater aquarium setups. You will get better growth rates when you keep them in optimal conditions though. 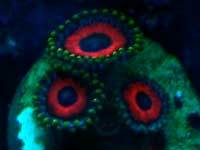 There is a broad range of zoanthid colors available and the price tag is tied to the color morph and the size of the frag you're buying. The cool part is that once you've acquired a small frag it's fairly easy to get them to grow. Don't waste money on the larger frags. A polyp or two will soon turn into four which turns into eight and on and on. What kind of water conditions do these zoanthids require? 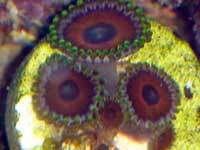 Give these zoanthids moderate to high alkalinity, calcium and salinity levels and they should grow well. Moderate to high lighting levels are good for better growth rates. These colonies grow in colonial mat like growths and with time can cover a rock completely. Fragging zoanthids couldn't be easier. It does take a little time for them to spread, but once they do you can trade zoanthid frags with friends, at club meetings or even try to sell them back to the local shop for store credit or even cash. See the how to frag section below for fragging ideas. There is a warning when keeping them. Some species of zoanthids can be toxic to humans, notably the palythoas. Wear gloves when handling them or if your hands and arms have to be in the tank for whatever reason. Wash your hands thoroughly after you're finished working with them. 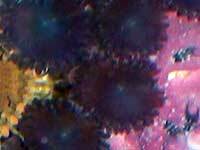 These are really interesting looking reef organisms and there is sure to be a color morph out there that suits you. Care Level : Could be considered easy to keep and good for saltwater beginners. Keeping these as a first "coral" is a good way to get your feet wet keeping corals. Origin / Habitat : All over. Zoanthid Temperament / Behavior : They are peaceful but can grow fast, sometimes encroaching on space needed or planned for other corals. How to Frag : These button polyps are easy to frag. If you have some smaller pieces of live rock rubble you can group the rubble together and place the frag of polyps in the middle then wait for it to spread to the pieces of live rock rubble. You can also get some of that platic grid looking stuff used in ceiling lighting to propagate these zoanthids. Place some aragonite frag plugs next to each other using the grid squares to hold the frag plugs then place the zoas in the middle and let them grow. 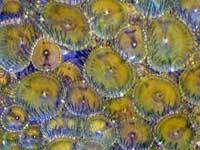 Zoanthid Food : Should get most of what they need from tank lighting and possibly filter feeding on bacteria and other items in the water. 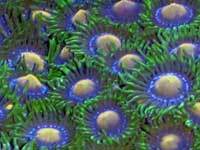 Zoanthid Light : It's commonly thought that brighter colored specimens come from shallower water and the darker colored ones come from slightly deeper water. Water Movement : Moderate to high and turbulent flows are good. High flow may make them contract their stalks or shorten, lighting may play a role in this too. Friends think I'm silly with my zoanthid craze but some of the colors on these guys are mind tripping. I've kept many different species of soft, lps and sps corals over the years but for beauty I think these are my favorites. I don't purposely feed mine. They do sometimes get food that the fish in the tank miss. Keep the alk, magnesium and calcium levels on par and they should grow well for you. A relatively slow growing SPS coral that has a fuzzy appearance making it look somewhat like a cactus. Their polyps will pulse or, in other words, open and close. Picture your hand slowly opening and closing and you'll get a good idea of what we're trying to describe.